Dr. Samuel Verghese is a missionary physician. 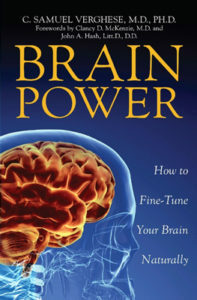 His latest book, Brain Power, is highly recommended for brain-mind power seminars. It’s a must read for every Christian. In the late 1970s, Dr. Verghese was one of the first to provide brain chemistry balancing, stress management and spiritual wellness programs to corporations and churches. Brain Power is thoughtful, scholarly writing on a practical neuropsychotheology from a Christian perspective. Dr. Samuel Verghese can help you move from shallow Christianity to great freedom as a serious and joyful believer. Combining lucid writing with clear case studies form his own clinic experience, Dr. Verghese’ s book constitutes a noble effort at grappling with some of the most difficult biblical concepts about the brain, mind, body, and conscience. It’s also compelling as a resource in our ultimate purpose for balancing our brain and becoming more like Christ. The inclusion of patient characteristics, the nature of disorders, and treatment protocols illustrates the importance of designing specific individualized treatments to balance brain biochemistry deficits. Samuel Verghese, MD (AM) PhD, DAAPM, BCIA (EEG), DAPA, has more than 45 years of experience in holistic medicine. His investigation of the interrelationship of brain biochemistry, mind, spirituality, and physical health began in adolescence. His journey has taken him to many educational institutions (including Harvard University) and spiritual communities, which over the years equipped him to serve people with challenging needs. Beginning in the 1970s he had the privilege of conducting workshops across the United States on many topics including brain chemistry, stress management, and natural Christian approaches to health care and spiritual development. His quest to discover new botanical healing remedies recently took him to the rain forest of South America. Throughout his journey as researcher and perennial student of life, devoted husband and father of three, author, clinician, formulator of nutritional supplements, college professor, volunteer Christian medical missionary and minister, Dr. Verghese has doggedly pursued his passion to heal and lead his fellow travelers to the triune God. — James F. Claire, D.O.